Back in May I pointed out how May’s local elections showed UKIP hitting Labour the most, contrary to the widespread conventional wisdom. Now new data from ComRes makes a similar point. There’s a good follow up piece by John Rentoul over on the Independent website. I thought the text in brackets at the top of this post was pretty clear :), but judging by some of the reactions to this post along the lines of ‘OMG! That can’t possibly be true! You’re not comparing like with like!’, it’s worth emphasising the point again – these figures are about what has happened to the levels of support for parties in 2013 compared with 2012. The figures take into account the different range of wards up for election last year and this as they are national equivalent vote share calculations. This post on the LSE site has a good introduction to what those calculations are and what they mean. 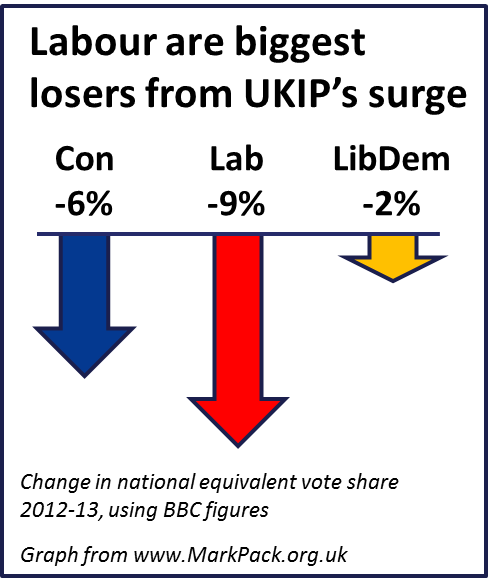 There has been much debate about what effect the rise of UKIP is having and who it is taking votes from. Our polling shows that the party is taking much more support from past Conservative voters than past Labour voters (according to our latest online poll, UKIP took 19% of 2010 Tories, but just 7% of 2010 Labour voters). However, the graph above shows that UKIP is affecting Labour’s vote share by pulling away potential new voters who previously sided with the Tories, and that once upon a time, in a two-party past, might have switched to them when frustrated with the governing party midterm. This has a number of effects. The first is that while UKIP are performing well, it is likely to bring down the ceiling of Labour’s potential vote share, something that should worry the Opposition as it searches for a majority.